As the season changes, common cold is the first thing which hits adults and children equally. Common cold is a self limiting condition and gets better on its own in stipulated time. Unless high fever or throat infection is present not much of the treatment is required. In absence of any secondary infection home remedies are enough & effective to deal with it. This is the most effective way to ease nasal congestion and runny nose. Bring water to boil in a wide pan till steam begins to form. Keep head above the pan (at least a foot away) and deep breathe through nose. A readymade steamer is a safer option to do so. For added effect, add 1 spoon crushed ajwain (carom seeds), a dollop of Vicks Vaporub or a table some peppermint/ menthol oil. If taking steam is not your cup of tea, go for a long, hot & steamy shower in an enclosed cubicle. It will moisturize and decongest your nasal passage. Gargling will moisten and soothes a sore and scratchy throat. Take a glass of lukewarm water and dissolve a teaspoon of salt in it. Do it at least thrice a day. Nasal drops help in irrigating the nasal mucosa and in breaking down the mucous. This relieves congestion. Instead of commercial OTC nasal drops, you can make your own home made salt water nasal rinse. This will help in deactivating virus and bacteria from nose. Mix 1/4 teaspoon salt and equal amount of baking soda in a cup of lukewarm water. Fill a syringe without needle with this mixture. Bend your head over a basin and gently spray the solution into one of your nostril, keeping the other nostril closed with one finger. Let the solution drain. Repeat the process in each nostril 2-3 three times. When the nose is completely choked and you are unable to sleep keep an extra pillow under your head and lie on your back. This will drain down the congested nasal passage as the level of head becomes higher than the body. 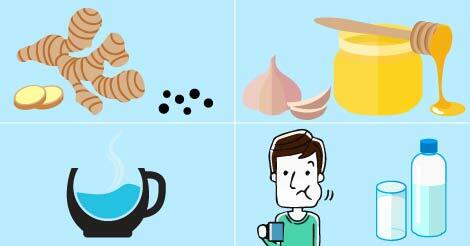 Garlic and honey are effective natural foods when it comes to relieving cough. Take 4 finely chopped cloves of garlic. Mix them in 2 tablespoons of honey and let the mixture sit overnight. Take 1 teaspoon of this mixture 2 times in a day. To alleviate hacking cough and irritation in throat, make a paste of ginger and some black pepper corns. Add a tablespoon of honey to this. Take half a spoon of this paste after every couple of hours.